In the first case, this is a joyful and jubilant event for their parents, in the latter scenario, things could go either way. Still, one thing that remains universal is the fact that it’s a big day in the life of any child and feeling left out could ruin the experience for good. In order not to allow this to happen, here are several tips on how to include your kids in the wedding planning process. Involvement in the wedding planning process needs to start even before you pop the question. Naturally, you won’t ask your kids for permission or even an opinion, however, they might feel as if you’re seeking their approval, which might make them develop a more positive disposition towards it. Moreover, if your kids have any concerns, you get to address them right away, instead of waiting for it to reach much bigger proportions. All in all, this will increase the level of trust between you and your kid, which is always a huge plus. We’re not suggesting that you should let your kid plan the entire menu on their own. The very thought of this would be ridiculous. Nonetheless, you can help them add this one meal or present them with several choices (that you’re really torn between) and ask for their opinion. Keep in mind that in order to honor their opinion, you need to accept their choice on the matter. It’s probably even better to take them dessert testing. No kid ever said no to ice cream sandwiches, chocolate chip cookies or mini peanut butter cups. Previous two ideas are something that can help your kids feel included in the process, for the sake of your relationship and their attitude towards the wedding. However, when it comes to sealing envelopes, they can actually be of great practical assistance. If you have several kids, you can even form a simple assembly line, thus automating this process by quite a bit. This is a win-win scenario, due to the fact that you get to do this arduous task much faster and turn it all into a family-bonding activity. As we already said, you can’t let your kid call all the shots, which is especially true when it comes to picking the location of the venue. So, when planning your wedding in NSW, you need to consider suitable Sydney wedding packages and pick one that suits all your needs. We’re talking about the size and location of the venue, as well as some additional features. Nevertheless, no one expects you to book the location without checking it out in person. When you decide to finally go there, it would be smart that you bring your kids. Making plans is important, yet, it’s something that’s not nearly as interesting for kids as it is for adults. That being said, you need to give your children a role in the ceremony that they can look forward to, even rehearse for. Most commonly, children are ring bearers or flower girls but they could also become bridesmaids or groomsmen, should the need arise. Tradition is one thing, but nothing’s written in stone and it’s a completely acceptable idea that your child walks you down the aisle. Other than this, they can read a poem, sing a song or play an instrument, as long as they’re comfortable performing in front of a crowd. Remember that there’s a real risk of your kids getting bored by a lengthy ceremony unless they have some company. 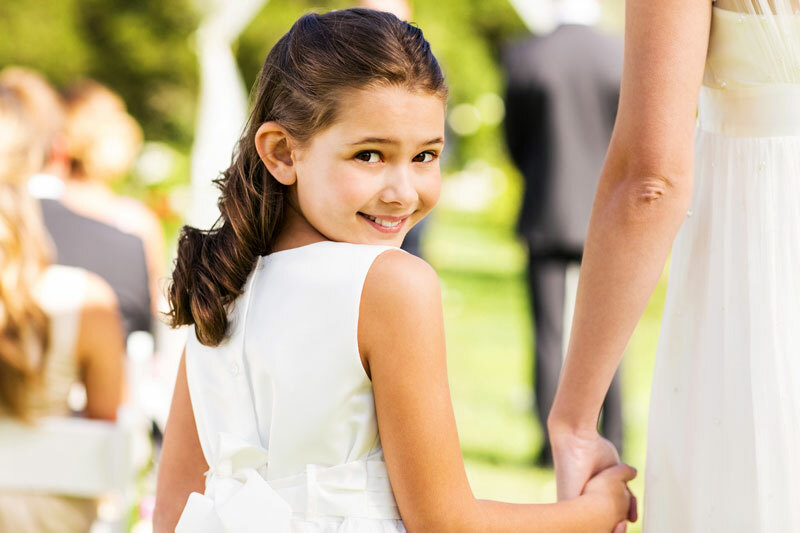 Now, having a horde of kids running around might be the last thing that you want on your wedding, however, your kid needs at least some company. Therefore, make sure that they have at least several peers to mingle with while adults do their own thing. This way, everyone will be much happier. Perhaps the most important thing of all is to include your kid in the wedding vow, in order to show them that things won’t change for worse and that they’re still the most important thing in the world. Sure, a wedding should be bride-and-groom-centric, however, when you have children priorities tend to change. It’s also a good idea not to mention this beforehand but to keep it as a surprise, instead. Other than this, it might also be quite thoughtful to mention them during the toast. From all this, it becomes more than clear that including your kids into the wedding planning process isn’t nearly as hard as you expected it to be. All you need to do is try and put yourself in their perspective. You would be surprised how clearer things might become once you apply this technique.